If we except death, ischaemic spinal cord injury (SCI) represents the most devastating postoperative complication of open and endovascular descending thoracic and thoraco-abdominal repair. Through experimental and clinical studies, a large number of diagnostic, surgical, anaesthesiologic and intensive care management innovations and modifications have been introduced during the last half-century in order to reduce dramatically the incidence of SCI. This has led the surgical community to better understand the physiology of the spinal cord and the neural structures and to evolve from a strict anatomical vascular concept of spinal cord protection to a more physiological one. In the present chapter, we shall describe the anatomy and physiology of the spinal cord, the consequences of ischaemia, the techniques and improvements regarding spinal cord blood supply and the strategies for shortening intra-procedural spinal cord ischaemia and for increasing spinal cord tolerance to transitory ischaemia through detection of ischaemia and augmentation of spinal cord blood perfusion. Hopefully this will help surgical teams dealing with thoracic or thoraco-abdominal aortic repair in decision-making algorithms in order to understand, prevent or reverse ischaemic SCI. Estrera AL, et al. 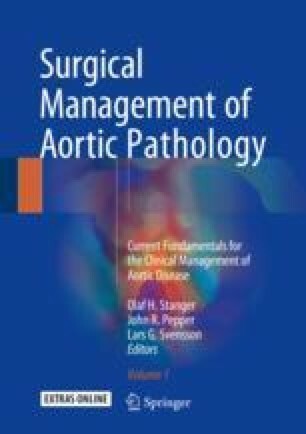 Adjuncts during surgery of the thoracoabdominal aorta and their impact on neurologic outcome: distal aortic perfusion and cerebrospinal fluid drainage. Multimed Man Cardiothorac Surg. 2006; https://doi.org/10.1510/mmcts.2006.001933.